The most effective tool is one that reports a good number of true positives, without too many false negatives, without consuming too much compute resources. When deploying one of these tools, or deciding which tool to purchase, users should consider this trade off to maximize the benefit of using the tool. There are lots of factors that influence this decision. In my previous post, I discussed the various human factors involved in evaluating static analysis tools. This post continues that discussion by introducing an economic cost model that provides objective evaluation of each tool's results. Equations derived from the model allow users to compare tools using simple warning report counts. Many factors contribute to the economics of static analysis tool use; and the relationships between them are not always straightforward. The model I introduce here is a coarse approximation that attempts to capture the important aspects of the process. It attempts to be useful while remaining simple, so some subtleties are not considered. Where N is the number of defects found, R is the recall, the measure of the ability to find real defects, and P is the precision, the ability of the tool to exclude false positives. There is more background on these definitions in my previous post. Given these definitions, we can see how good some example tools are at finding real defects. Let us now consider three hypothetical tools (or configurations of the same tool) that occupy a position along the recall-precision spectrum discussed earlier. Tool A is reasonably good at finding defects, with a recall of 60%. Half of the results it reports are false positives. Tool B has a precision of 80%, meaning it is very good at suppressing false positives. However, it finds only 30% of the real defects. Tool C has a recall of 95%, so is extremely good at finding defects, but its precision is only 10%. all defects with no false positives, and not using a static analysis tool at all. The tool properties are summarized in Figure 1. Figure 1: Properties of the example tools. Let us suppose that the number of defects that are not detected by other means is N=100. Figure 2 shows the raw results from the tools. Now what really matters is how those raw results are interpreted. As discussed in my previous post, some real defects will not be recognized as such. Figure 3 shows two histograms of the defects that remain in the application under the linear and cubic models for true positive recognition. Figure 3: The number of defects that remain in the application for the linear (left) and cubic (right) true positive recognition models. Clearly, fewer defect totals are better. What emerges from this model is that there is a sweet spot in the tradeoff between precision and recall. Tool A had worse precision than tool B and worse recall than tool C, but when it is used, fewer defects remain in the application. The probability and cost of an incident caused by a defect. Software defects and security vulnerabilities are depressingly commonplace, but not all of them cause serious problems. Many lie dormant and unexploited before they are removed through routine maintenance. This can be modeled by assigning a probability that a defect will trigger an incident during the lifetime of the product. If a defect does cause an incident, there will be a cost of dealing with that incident, and this cost can vary enormously. Incident consequences can include product recall, disruption to service, damage to reputation, theft of property, litigation, and even death or injury if the application is safety critical. The best case is that few customers are harmed or inconvenienced by the defect and that the defect is fixed and deployed through normal maintenance processes, but even that has a cost. The numbers shown below in Figure 4 are based on a probability of 5% and an example incident cost of $40,000. The time to correct a defect. Regardless of whether a defect causes an incident, there is an engineering cost to fix it. Bugs that are found earlier are much less expensive to fix. Those that are found later can be especially costly to fix as the product may have to be retested. In the calculations below, we assume it takes 4 hours to fix a bug early in the development cycle, versus 20 to fix it after deployment. These numbers are based on a 2002 NIST report. The time to triage warnings. It takes time to triage a warning report from a static analysis tool. Most can be triaged quite quickly, but complicated reports may involve lengthy paths through the code, multiple levels of indirection, and complex relationships between variables. Such reports can take a non-trivial amount of time to triage. We have found that triage takes about ten minutes per warning on average, and this has been confirmed by others. Engineering labor. This is modeled at $75/hour including overhead. Tool deployment cost. This includes the cost to purchase the tool and to deploy it on the code. The model assumes that Tools A, B and C cost $20,000, and that the two controls have zero cost. The cost to purchase the tool and deploy it. The cost of the engineering labor for report triage. The cost to fix defects found by the tool. The engineering cost to fix those defects. The cost of handling all the incidents triggered. To judge the benefit of a tool, we can compare these costs against the cost of dealing with the defects found if no tool had been used. Assuming the cubic model for true positive recognition, Figure 4 shows the cost breakdown and benefit. Figure 4: Cost breakdown for the example tools (left), and the benefit of using each tool compared to using no tool (right). These numbers are derived from the values discussed in the previous paragraphs. Again the tool that strikes a reasonable balance between precision and recall is the one that is most beneficial to use. 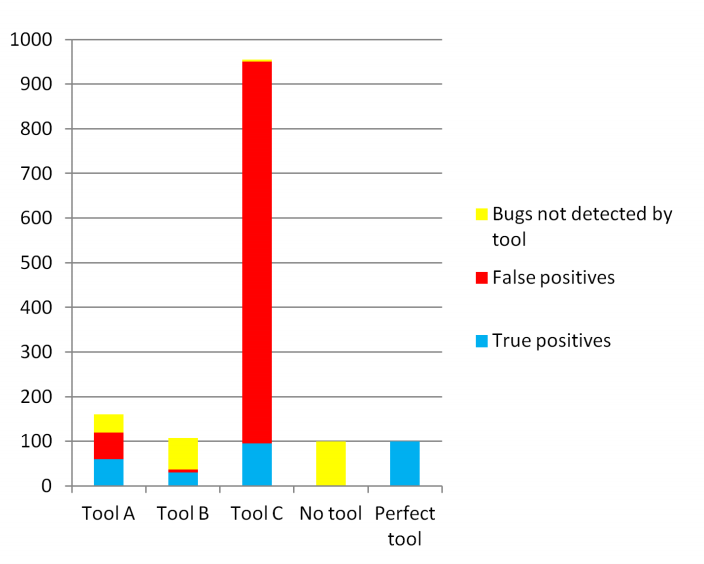 Tool A is more beneficial even though it found only about half as many real defects as Tool C, and had eight times more false positives than Tool B. It is also interesting to note that Tool C sits slightly below the break-even point, even though it has the highest recall. The relative order of the tools is fairly insensitive to the actual numbers used for the cost and the probability of an incident as long as the cost of an incident exceeds the cost fixing the defects found by the tool. In such an extreme case however, the most cost-effective strategy is to use no tool at all. This model confirms that the benefit of using a static analysis tool is dominated by its ability to find real defects that are subsequently recognized as such. Although there is a cost to triaging the warnings, this is relatively minor compared to the cost of an incident. Consequently, we can conclude that a tool’s effectiveness, i.e. its ability to find real defects that are correctly recognized as such, is a good approximation to its overall benefit. Note however that this requires knowing the value of recall, which as discussed earlier is notoriously elusive. The next section describes how we can eliminate that unknown and use the model to compare tools using easily harvested data. Static analysis tools are effective at finding serious programming errors and security vulnerabilities. Precision and recall seem to be closely coupled, so that increased precision yields decreased recall and vice versa. However this must be balanced against the risk of the analysis failing to find real bugs. Users generally feel better about configurations that keep false positives very low, but the model shown here demonstrates that the sweet spot that maximizes the benefit of using the tool means it is worth tolerating a much higher false positive rate as long as the tool is also finding more real issues. Users can employ the economic model presented here to help make rational decisions about how to deploy static analysis in their organization. The model is easy to use, requiring only simple counts of true and false positives -- data that is easily obtained. An objective comparison of static analysis tools is best done with your own code - finding issues that are important to you, measuring the true and false positive count, and plugging the results into our cost model to compare the results rationally.